Yep. Adds a nice spice to the whole thing. Kind of a low but persistent heat. Local place Pizza Luce seems like it would be expensive, but it really isn't. It works well to take my G/F to, because they have dairy free cheese (she's lactose intolerant). Being made for rolling would help explain why so much thin-crust pizza is trash. I love thin crust pizza (mostly because it's lower calorie and just as satisfying), but it's rare that I manage to find one that doesn't just flop over and spill its contents everywhere. Sometimes I ask for the crust to be well-done, but then I just end up with a stiff, half-burned crust, which is also not ideal. Panago is good stuff. Haven't had them in a while, though. There used to be two in my city and another half-dozen within a few hours drive in various other cities, and they have since closed down every location east of Ontario. I've heard that apparently they expanded too quickly. Visiting a Panago is my #1 to-do item the next time I'm in Ontario. BC Pizza, for those in the West side of Michigan. I'm in the alfredo-spinach-tomato with chicken and/or bacon pizza camp. My preferred local (ish, it's a small chain) does something like this, but with broccoli instead of spinach. It's what I get if I don't get the Southwest Steak and Portabella Mushroom, that's got a good mix of stuff on it as well. I'm pretty easy about pizza as long it sticks to one rule: it has to be savory. That means no pineapple. I love thin crust pizza (mostly because it's lower calorie and just as satisfying), but it's rare that I manage to find one that doesn't just flop over and spill its contents everywhere. Sometimes I ask for the crust to be well-done, but then I just end up with a stiff, half-burned crust, which is also not ideal. I prefer thin crust pizza too but I have trouble finding one that isnt the approximate texture of overcooked matzoh. Give me all the soft thin crusts you can. Being made for rolling would help explain why so much thin-crust pizza is trash. I love thin crust pizza (mostly because it's lower calorie and just as satisfying), but it's rare that I manage to find one that doesn't just flop over and spill its contents everywhere. Sort of. But let's not pretend that HILARIOUSLY LARGE slices aren't also a cause. You'd probably have to fold a thicker piece of pizza too if it was the size of a fishing net. So Fredericton sounds like my hell (or at least my purgatory). Big Mama’s And Papa’s Pizzeria is much like any other regional pizza chain, sporting several locations in southern California. This one stands out, though by one special distinction, only available at its Northridge location: It boasts the world’s largest deliverable pizza. That’s “deliverable,” as in if you have $300 and 24-hours notice, and are in the Northridge delivery area, you can get a 54" x 54" pizza delivered to your home or workplace, if it can fit through the door. the pepperoni is really heavy towards the lower-left corner, but the further you get from that, the more sparse it becomes. As such, I stake my claim in the southwest region. 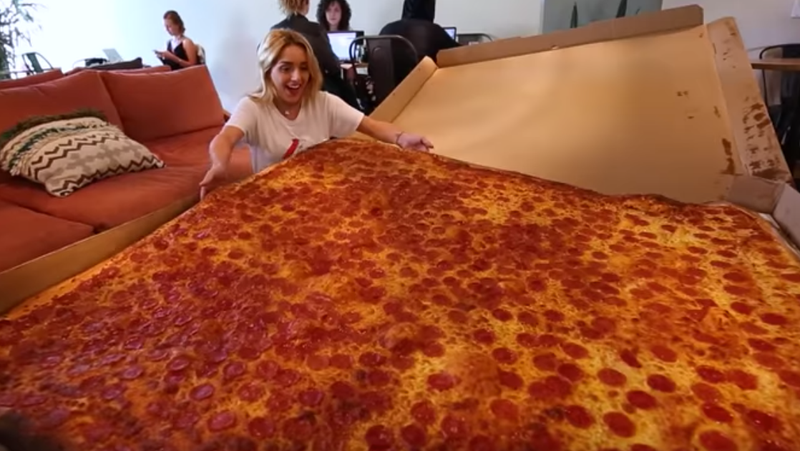 It's like they didn't even consider the logistics of this square pizza with 4.5 foot sides. I stake my claim in the southwest region. Do you mean all of it!? The process video is neat. Well, that answered all my questions, except to taste one for myself. There's a new calzone place in my town. It's fantastic! Unfortunately it is... out of the way isn't the right term, but it's not in the best location for a restaurant. But it IS in a good lunchtime location if people in nearby businesses choose to eat there. So I hope that's happening. Anyway, both the calzone and the dip it comes with (there's no real sauce in the calzones themselves) are amazing. If you are ever in the Fredericton area (which might be true for two or three other talking timers who may come to town for some reason), go to Red Oven. EDIT: The ovens are indeed red and they look like old timey robot heads. Someone brought pizza to a work luncheon today. The luncheon had a crock pot theme. So the pizza was cooked in a crockpot. There's a new calzone place in my town. It's fantastic! I had the Hey Joe with the jalapeno lime aioli for dipping and it was divine. As one of the only TT members who might ever have a meal in Fredericton, I'll try to keep this place in mind for the next time I'm in the area (which will probably be in about 8 years at this rate). Shrimp scampi? 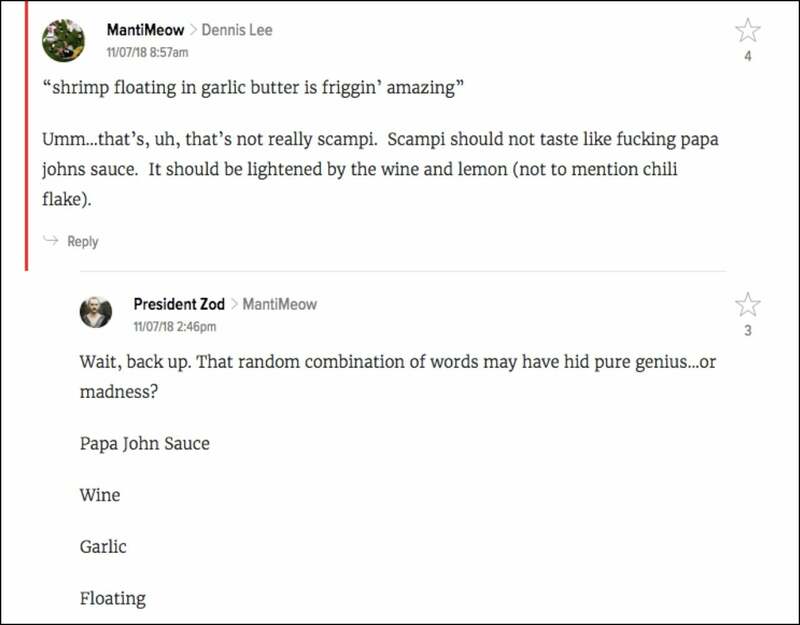 Papa John’s garlic sauce? I had to make this. Thanks, commenters. I owe you one. Pieology: still good but jesus they have jacked up their prices. Might just be the local manager getting into the truck stop spirit though. Plan is to go to Little Caesar's tonight and try the new Crazy Cruncher. Love their Crazy Bread, but I miss the way it used to be, like these cut-up strips of bread instead of individual sticks. While I was in New York and surrounding areas for a week, three different people asked me about or made fun of deep dish pizza. I didn't know that this was really a thing that New Yorkers cared about! I think they imagine that we eat it constantly and like pick up slices of deep dish on the corner. Deep dish is really good and also incredibly filling and I have it about once a year. The rest of the time I eat lots of different types of pizza. New York style pizza is fine, and it doesn't really make sense to compare it to deep dish. Like, you don't have to choose one or the other, they're both good. Look, pretending to have really good pizza is a very important part of New York's cultural identity. Why does New York have such a weird inferiority complex / chip on its shoulder about so many things?